Luke Piper is the eldest grandson of the artist John Piper, and son of the artist Edward Piper, with whom he shared his first show in 1992. He was born in 1966 and brought up in Frome, Somerset. He read Geography at Cambridge and his course led him to Melanesia on an anthropological assignment to study tribal warfare, giving him his first taste of travel. An expedition in 1995, taking eight months to drive from Somerset to Nairobi, through the Western Sahara and Zaire, inspired his Africa 95 paintings and the London exhibition of the work he produced on this trip was a sell out. Subsequent expeditions across Southern Africa, Namibia and Mozambique led to another Africa show. He has travelled extensively since, finding inspiration in Morocco, Senegal and Australia. In 1998 Luke journeyed to Nepal to work on a commission for a new Hotel in the Himalayas, which inspired him to make a second trip and more paintings, culminating in a hugely successful show, which included work from Turkey, Iran, Pakistan and India. Luke continues to travel widely across the world, seeking sources of inspiration for his paintings. His work is exciting, colourful and dramatic; the vibrant energy in his paintings reflects the resonance of colour and form between manmade and natural features. 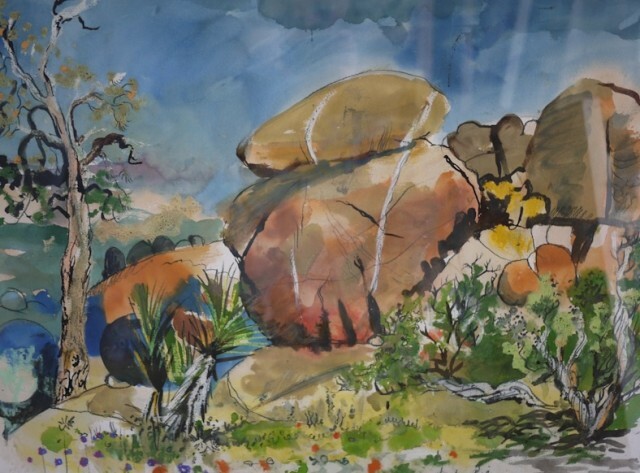 His paintings are imbued with the vitality and immediacy of those plein air experiences that make him want to paint. Luke exhibits widely across the United Kingdom.